Tinkercad is a simple and online tool for 3D design and 3D printing for the masses. One thing you need to know upfront – you need to have a stable internet connection at all times in order to use this software. You can’t use it offline. You must use this 3D printing software with a mouse or touchpad and it’s much easier to use with a desktop computer or properly equipped laptop. Forget about trying to use it on a tablet or phone – it will frustrate you to no end. If you have a large enough tablet with a scrollpad, you may be able to work with it. That being said, any sort of CAD program requires a fair amount of computing resources to run and generate parts and if you have a small screen it will make things extremely difficult for you. All that said, this program is great for students or anyone wanting to learn a framework of the design process by combining several simple objects into more complex shapes. It also allows users to choose shapes to peel off of their projects, providing an easy way to create arcs, holes, or anything using negative space as a tool. In addition to these two basic techniques, students also have a variety of other tools, such as: stretch, rotate, and distort as quick examples – similar to the tools found in a 2D photo editor. Please note that some of the links found below may be affiliate link and we are a participant in the Amazon Services LLC Associates Program, an affiliate advertising program designed to provide a means for us to earn fees by linking to Amazon.com and affiliated sites. A really great feature (maybe the best of all) is that designers can order 3D prints of their creations. So they can easily design their own smart phone cases, custom LEGO parts, or anything else they can imagine with flexible combinations of 3D objects. If you are so inclined, some users have even imported some of their creations into Minecraft. This provides an excellent opportunity for designers to improve their Minecraft skills by designing more complex structures in Tinker cad and then developing them into Minecraft while turning the learning process into more of a fun game. Some of the links on this page are affiliate links and as an Amazon Associate I might earn a tiny amount from qualifying purchases if you end up buying something through one of them. 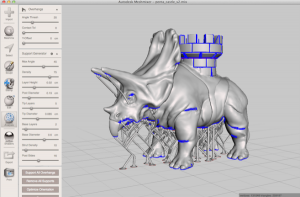 • With 3D printing, you can also import external 3D files that will become editable forms within the platform. • If you’re new to 3D design, Tinkercad offers a set of tools and tutorials to help you explore and discover the process. It also provides step-by-step design process lessons to help newcomers acclimatize to the design process. You can also search for ideas in the library with over 4 million predefined templates and get tips from other community designers. 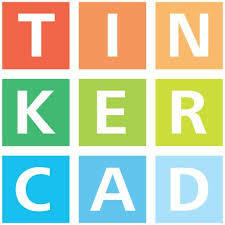 • Tinker cad can be used as a 3D design platform or as a 3D printing service. The application allows you to print your designs with your own 3D printer and hardware. This allows you to control all phases of the 3D printing and design process, which is unique among the 3D printing service providers. Or, if you do not have a 3D printer, Tinker cad offers direct integration with third-party printing services that offer a range of printing options. That means you can have your design printed and deliver it to your door in one click. • It’s also a free web application. It works on Windows, Mac and Linux operating systems and works best with Chrome and Firefox browsers. The web architecture of this CAD software allows team members to collaborate on designs from around the country for free. 3D design files are stored in the cloud, making them easily accessible from multiple computers. 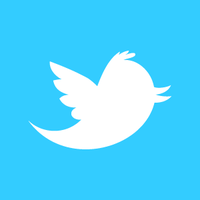 You can try it free here. 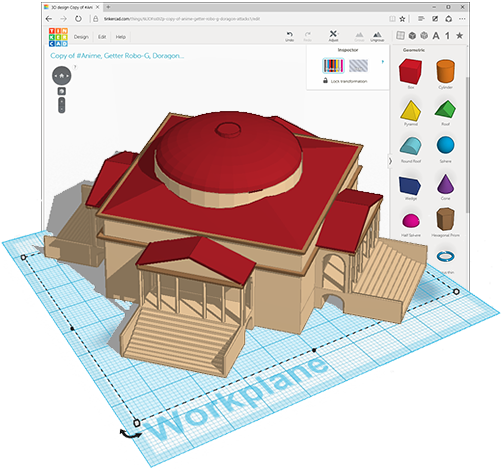 • Tinkercad doesn’t just focus on 3D design tools instead of 3D printing services – it offers both. With 3D printer tutorials and resources, designers at all levels can enhance their design capabilities and lead products throughout the process. 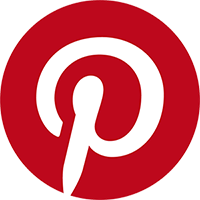 • You can create new projects and save them online. Everything is stored there. So you can literally create your parts from wherever you are located. • You can create a project and see things from the page view, and you can change anything you like. They also have a grid on the floor that helps you to see guage the orientation and size of the part which is a really nice feature. • It’s more intuitive than SketchUp and easier to learn, which is a great advantage in educational contexts, as it is difficult to give up working hours to learn curves. Shapes can be stretched, reshaped, copied and pasted, grouped, and various shapes joined to create a new shape. A blank canvas is included as a shape generator that lets you create custom and unique shapes. Shapes can also be imported from designs created in other software or from URLs. • Sometimes it can be difficult to follow the dimensions. However, once you get used to the program it becomes a lot easier. While the program is fairly intuitive, this is one area that takes a little practice. • There are limits to what you can design with this program however. Because this program uses geometric shapes, it can be difficult to get really creative because you can’t really draw freeform shapes to exactly what you want to draw. You have to understand how to do it within the provided forms and limitations of the software. 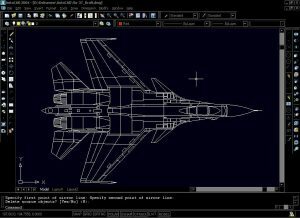 As this program is owned by Autodesk it receives regular updates and is currently free – so it will be a tough program to beat on those grounds alone. That being said, here are a few free Tinkercad alternatives along with a few that aren’t free but are generally considered the top choices in the industry. I love AutoCAD. It’s the first CAD program that I learned to use and while I’ve only ever used it for 2D modelling, I found it really opened my eyes as to what is possible when it comes to designing in CAD. But AutoDesk has a variety of different programs all aimed at specific aspects of CAD from 2D to mechanical engineering and architecture to 3D part design. AutoDesk owns Tinkercad and has a number of other programs like AutoCad, Inventor, Maya & Revit – depending on what exactly you need to do. There seems to be a some overlap in terms of what these programs offer, but it looks to be a very well rounded suite of CAD programs. You can check out what they have to offer here. Sketchup weighs in at almost $700 USD for a license so it isn’t cheap. Google was the company that created it in the beginning, but it’s now owned by a company called Trimble. It’s core strength is for modelling or designing things that are more rectangular in shape. Think along the lines of a house, a shipping container, or something like that. If you have curves or 3D spherical shapes, you might find that Sketchup is pretty lacking. On the upside, Sketchup has a vibrant and growing community of users that create and share all sorts of models & plugins. And this really expands Sketchup’s reach in terms of being able to export files to STL or something 2D like a DXF for laser or water cutting. If you want a quick primer on Sketchup, try this one. 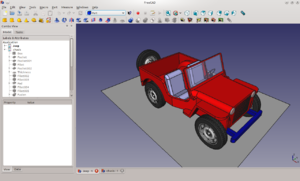 FreeCAD is an open source CAD program and is built primarily for Engineering and product design. It has a lot of advanced features, but the learning curve is incredibly steep. It is a fairly professional program and you can’t beat the price (free) but it can take users quite a bit of time to figure it out. With that said, I would highly recommend getting a book on it or spending a lot of time searching online to help you figure it out. Meshmixer is maybe an intermediate level 3D modelling program that let’s you create profiles and products using meshes. As the name implies, you can mix meshes together in order to create different objects and shapes – many of which are commonly available on the internet. It’s free so it’s worth a try and the fact that it can export STL files helps cross-functionality between many different design programs (like Solidworks). I’ve heard that it’s relatively easy to use and learn, but I’ve never tried it myself. While it is still free and open source, it requires quite a bit of effort to overcome the learning curve. 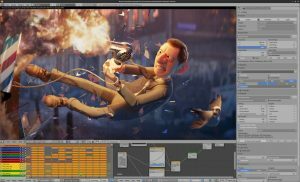 This is a popular option for those looking for 3D modelling in the gaming industry, but it’s cross-computer functionality (IE works on Mac, Windows, Linux) and ability to export many different file types makes it a strong contender. If you’ve never attempted 3D modelling and want to go the Blender route, you should pick up a copy of this book to give you a bit of an understanding on where to start with this powerful program. If you don’t want to go want to go with TinkerCAD you could make the jump to Solidworks and you can do virtually everything with it. You can compare files, come up with a list of materials required for a job, model the part, construct 3D or 2D drawings and the list goes on. But it is fairly pricey and there is a bit of a learning curve with it. There is a fairly big learning curve with Solidworks so if you do end up trying it out I would highly recommend getting a training dvd like this one to help you get up and running. If you’re just looking for a more basic program, you can use something like AutoCad. And you can draw in 3D in AutoCAD, but I’ve always found it difficult to do anything other than 2D as it’s very easy to get the plane of the item off and then it can be difficult to properly dimension parts. I found AutoCAD easy to pick up but if you want a few shortcuts, you can review this book here. 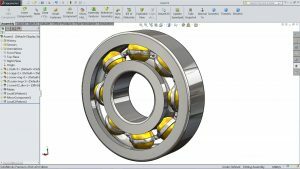 Solidworks is pretty much the industry standard when it comes to manufacturing and producing parts so if you’re looking for one program that does everything, Solidworks is probably the way to go. If you don’t have the money for Solidworks, I’d check out AutoCad or something from AutoDesk’s suite of offerings. The great thing about Tinker cad is the user-friendliness and as the name seems to indicate itself – you have to “tinker” with it. Once you enter the flow of resizing forms and use the Cave function, you can design complex advanced models in a relatively short amount of time. Tinker cad is customizable in terms of how you want to work but you usually end up designing with defined dimensions or modelling by eye and simply experimenting with the various shapes by stretching and stacking them. You can add new routings to define the scale of the grid and choose whether to work on a metric or imperial scale. The design possibilities are seemingly endless with this program. 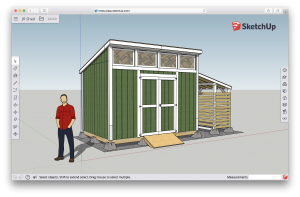 As it’s fairly easy to learn and supported by AutoDesk (the company behind AutoCad) I would highly recommend using it before trying something more advanced like Sketchup. And if you’re looking for a quick primer to get you modelling in 3D quickly, be sure to have a look at this book.